All transactions are safe and secure with a reliable history in online purchasing behind each of our associates. Buy the Real Cat in the Hat t-shirt to own Dr. Seuss clothing and merchandise. It's no surprise that this literal design is a bestseller. Wear it if you are feeling like there is a wasket in your basket, woset in your closet or a yottle in the bottle. According to the book There's a Wocket in My Pocket, you just may be right. After all, just because you can't always see them, doesn't mean they don't exist. If you are certain there is a jertain in the curtain, then perhaps you would be pleased to have a wocket in your pocket. If that is the case, then grab this Dr. Seuss t-shirt for adults. Its unique style will get the attention of your friends and fellow fans of the books. 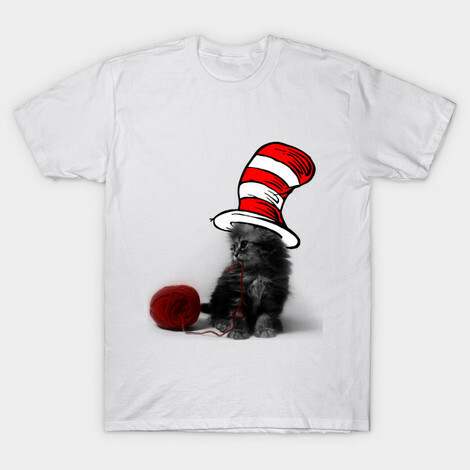 In addition to the Real Cat in the Hat tee above, browse the Dr. Seuss Clothing Gallery for more apparel like men's and women's clothes, kids shirts or hoodies.